About a month ago, Real Artists Don't Starve popped up on my Goodreads feed, and, based on the title, I decided to check it out. My history with the practice of an art (in my case, prose) is extensive, and although my history with the business of publishing is sordid, I also learned a ton. I was curious to see if Jeff Goins had written something that would rise above the general dredge of self-help literature and teach me something I didn't already know about managing the business aspects of art. Sadly, it was worse than that. Not only did Goins fail to teach me anything new, his approach to discussing the topic introduces further confusion with a number of inappropriate conflations. By this I mean that Goins's frames of reference for argumentation only fit reality if you focus on a very narrow band of human experiences. My intent in this review is to pull apart these conflations and fit their targets into frames of reference that fit broader swaths of reality. 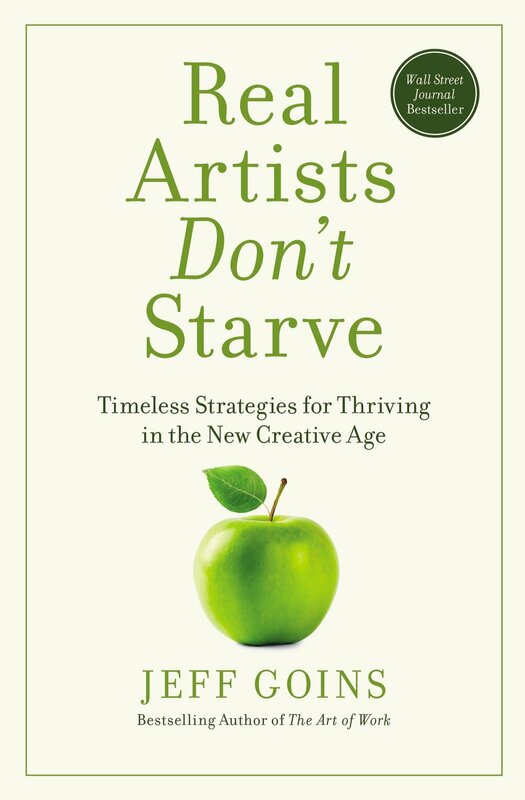 I will show that the sentiment behind the title, that "real artists don't starve," while, in a sense, true, is not true for the reasons Goins claims. On the contrary, the current state of the world is about as far from a "New Renaissance" as it could possibly be. I will start with the conflation that makes most of the book's premise possible—namely, the conflation of a piece of artwork with an artifact of commercial production. It is through this lens that we can see Goins at his most self-contradictory. Money both "matters" and "does not matter" (chapter 12), and immediately following chapter 9, "don't work for free" (e.g. sell your work), comes chapter 10, which encourages the artists to "own your work" (e.g. don't sell your work). The fundamental tension here is ultimately the question, "who does the generative activity serve?" Goins appears to want to live in a world where the products of artistic endeavor can be made profitable solely by making the right social connections. However, this stance ignores the fundamental reality that works of art, in the true sense of the word, will be inherently unattractive to the vast majority of people, and therefore fail as a product. Artwork and products are fundamentally different things. Works of art are crafted for no goal other than an artist's realization of their vision. Products are crafted to sell. Real artists decide to create the former, and only later concern themselves with the latter, if at all (because the artist should be devoting as much energy as possible to honing their art). To pretend that there is some world where works of art can also be successful products is either to debase art or to presume a wildly unrealistic analysis of the kinds of things that are capable of selling well. If one adopts the more realistic outlook I have outlined here, the result is a fundamental tension between spending one's time on making enough money to live comfortably and spending one's time practicing one's art. Goins treats the subject of selling out haphazardly. He gives no concrete examples of what it consists of, but it seems to be something akin to spending all of one's time practicing one's art in a context in which the terms of that art are dictated by someone else. This is odd, because all of the paths Goins defines as leading to the "Thriving Artist" (a counter archetype to the "Starving Artist") consist of being a slave to market forces of one sort or another. Goins outlines the three forms of supposed independence in chapter 12: create "art" that the market approves of, get a patron, or teach people how to create "art" that the market approves of (and charge for the service). To my mind, the first and third of these options entail enslavement to the market, and the second entails enslavement to a patron. Interestingly absent is the concept of buying time, by which I mean the act of saving up money for the purpose of freeing oneself from any of the above constraints. Money is power, and, as such, is the only way in our modern society of achieving freedom from market forces. Having conflated artwork and product, the concept of "selling out" has become non-sensical, and the real path to freedom (generating a savings) has been lost in the ensuing quagmire. Goins's treatment of patronage is also problematic. Michelangelo features prominently throughout the book, and it is here that the topic of patronage is first broached. However, when the discussion moves on to modern forms of patronage, another conflation appears. Patrons, in Goins's model, can be a business that wants to invest in one's art, or crowdfunding channels like Kickstarter and Patreon. I would argue that neither of these is truly "patronage." A better term would be "employment." In the case of a business, this is quite clear. A business will be forced to shutter if it does not submit to the pressure of market forces, and those forces will inevitably translate to pressure on their hired artists. Furthermore, Kickstarter and Patreon "patrons" are actually nothing more than the pure manifestation of market forces with the middlemen (managers and executives) removed. What Goins glosses over is the fact that real artists like Michelangelo had difficult relationships with their patrons, since they realized that their ability to execute on their vision would ultimately be constrained by the relationship. We know that Michelangelo's relationships with his patrons were difficult at best. "[A]lthough I have served popes, ... this I did under compulsion," he writes.¹ For his last major work, the cupola of St. Peter's, Michelangelo refused payment, worrying that he would sunder his art by tainting its creation with the profit motive. Goins displays a complete lack of understanding of this difference, and if he weren't writing a book about the logistics of creating art, then I might give him slack. Our culture at large seems to have lost this distinction entirely. I've written before about how it seems that our only remaining measure for "good" seems to be "market value." If artwork and products are the same thing, and if patrons and employers equate, then the idea of executing on a unique vision evaporates. Goins even goes as far as propping up the idea that artists should "steal" from one another (chapter 2). Interestingly, he uses the more correct term of "influence" many times, but his frame describes a method for making products more appealing by clearly appropriating the tropes and genre conventions of prior works ("stealing"). The title of chapter 2 is, "Stop Trying to Be Original." A better frame for the conversation would be to start with the fact that originality is a hard sell, but trying to achieve it is the only way to execute on a vision that is true to oneself. Market motivations have little place in a discussion of art. I have saved my least favorite conflation for last, and that is the total merger of artists, creators, and businessmen into a single category. Goins considers all of these to be "artists." The conflation is most evident in the example biographies he provides. Michelangelo, Van Gogh, and F. Scott Fitzgerald are discussed vis-a-vis Elvis Presley, Jay-Z, Beyoncé, an astronaut who paints, and a major league baseball player you will never have heard of who is working on a movie. Most disturbingly of all, the following also fit easily into this same category: Gordon Mackenzie, Jeff Bezos, and Steve Jobs. All are, apparently, "artists." Let me make this utterly clear. Artists (Michelangelo, Van Gogh, and Fitzgerald) fight tooth and nail in a rough world to execute on their artistic vision as faithfully as they possibly can. Creators produce what might be generously called mass-cultural artifacts, because they either pander to the market, or more likely, lack a vision entirely, but still enjoy the act of creation for its own sake (Presley, Beyoncé, et al.). And, completely outside the realm of any of this are businessmen, who neither have artistic vision nor produce artifacts, but simply manage large organizations of people (Mackenzie, Bezos, and Jobs). The ability to manage groups of people is certainly a skill, and it is certainly important, but it is far too much of a stretch to call such work "artistic." Further, our society would benefit from a renewal of the distinction between art and products, and consequently artists and creators. The reason that many people can get excited by the artifacts generated by creators is because they are designed to be appealing. And for many, this feeling of appeal equates to goodness. But that feeling is shallow. I fear that too many consumers have never reached, albeit counter-intuitively, for something difficult, something old, something strange, something complex—simply for the joy of doing the work to understand someone else's vision. That is the truly lost art. Most real artists probably don't, in fact, starve. But what they do realize is that, optimally, they would hone and practice their art independently of market forces. This invariably means compartmentalizing one's life to separate practicing one's art from the business of thriving in the world. This was my big lesson from publishing, and it was disappointing to see Goins send people off to run the same fool's errand I ran for three years. What real artists do is execute on a vision that is wholly theirs, one which may have a number of influences, but which is truly original. Too bad that sentence can't be turned into a catchy title. But even if it could, I doubt that such a self-help book would sell.